UPS deadlocks local hearing over shop steward terminated for union activity | Fight Back! 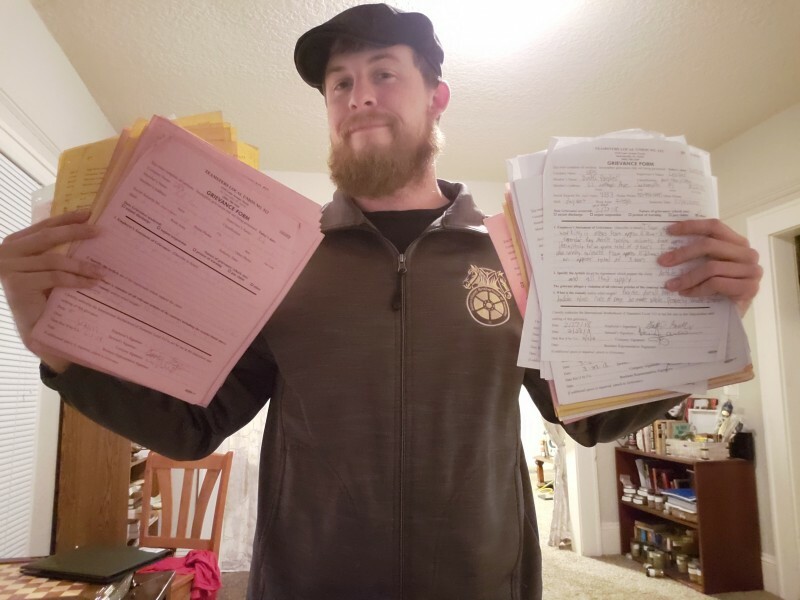 Jacksonville, FL – On July 3, UPS management in Jacksonville deadlocked a local hearing over Dustin Ponder, a shop steward for Teamsters Local 512 who was terminated last month for union activity. Presenting scant evidence against Ponder, the company refused to give the steward his job back despite protests by Teamsters locally and across the country. At the hearing, the company claimed that Ponder had committed dishonesty - a cardinal offense, under the contract. Their sole evidence was two statements by UPS managers with a history of harassment and anti-union activity, both against Ponder and other employees at the UPS River City hub in Jacksonville. On June 8, the company terminated Ponder, a union steward at UPS in Jacksonville, elected earlier this year. The two managers who wrote statements against Ponder at his local hearing – Terrence Thomas, the UPS division manager for the Jacksonville River City day sort, and sort manager Jeff Winterling – threatened Ponder with retaliation for his union activity just a week before his termination. Fight Back! was provided with a grievance filed by Ponder days before his termination. According to the grievance, division manager Thomas threatened to “get blood raw” with Ponder if he continued filing grievances related to safety, staffing concerns, and harassment. In the days that followed, UPS Teamster leaders in Jacksonville gathered at Ponder’s workplace, UPS’s new River City hub, to collect petitions from coworkers. About 70 UPS workers on the River City day sort – Ponder’s shift – signed the petition, and no worker who was asked to sign refused. Days later, over 100 package car drivers at the UPS Jax hub signed petitions demanding the company reinstate Ponder. Nearly 1,500 people nationwide signed an online petition in the days after Ponder’s termination demanding UPS reinstate the union steward. On July 2, one day before his local hearing, Teamster activists through the popular UPS Falling page on Facebook organized a call-in day to the UPS harassment hotline. More than 100 supporters called in, alleging anti-union retaliation and harassment by managers Thomas and Winterling against Ponder. Dustin Ponder, 30, has worked at UPS and actively organized in his union, the Teamsters, for nearly eight years. Back in March 2018, he was elected by his coworkers to be chief steward for the UPS River City day sort operation. He’s the co-host of a popular labor podcast, the Worker Power Hour, which has picked up a following amongst fighting Teamsters and union members across the country. Earlier in June, 93.18% of the UPS Teamsters voted to give the union’s national negotiating committee authorization to call a strike in their contract negotiations with UPS, which are ongoing. The Teamsters-UPS contract is the single largest collective bargaining agreement in the U.S. private sector, encompassing more than 230,000 workers. The agreement is set for expiration on July 31, 2018.